You’ll be hard pushed to find a writer as consistently good as Mark Billingham right now and The Killing Habit underlines this fact all the more boldly. Here the prose drip with nuanced observation, while the pace and hard-edginess of the plotline remains as majestically magnetic as ever. There’s also the fact that his greatest and best loved character, Tom Thorne, remains as fresh and compelling in this, his fifteenth tale, as he was in Sleepyhead, way back in 2001. We all know the signs. Cruelty, lack of empathy, the killing of animals. Now, pets on suburban London streets are being stalked by a shadow, and it could just be the start. DI Tom Thorne knows the psychological profile of such offenders all too well, so when he is tasked with catching a notorious killer of domestic cats, he sees the chance to stop a series of homicides before they happen. Others are less convinced, so once more Thorne relies on DI Nicola Tanner to help him solve the case, before the culprit starts hunting people. The wit and depth of Billingham’s skilfully crafted dialogue are front and centre, zipping things along at a lightning fast rate. So far are things stripped back, all that’s left is the bare enamel, so that the teeth of this tale can bite all the harder. With Tanner, the deliciously foul-mouthed Christine Treasure and the charismatic Phil Hendricks to bounce off, Thorne becomes even more three-dimensional and all the more credible. Yet without question it is the manner in which the author keeps his reader on the very precipice of nervous excitement that drives his masterful storytelling and in places, The Killing Habit really should come with a health warning. 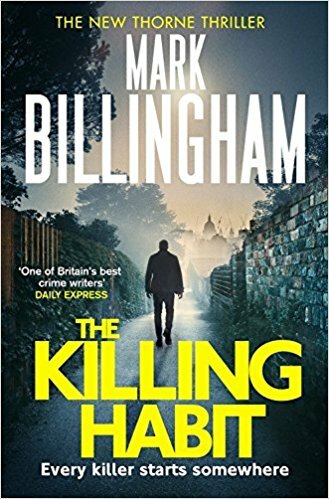 Beautifully constructed and a novel to be read in one hit if ever there was one, The Killing Habit is one helluva good read and a very worthy addition to Mark Billingham’s perpetually flourishing canon.